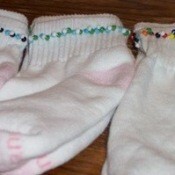 Beaded SocksSocks that have beads around the top. They make great gifts for co-workers for birthdays or Christmas. I found socks that were 10 pairs for $7. The beads, needles and string cost about $7. Bing The DogBing is a 12 year old Heinz 57 variety. I got from the ASPCA, 11 years ago.He loves to bark at squirrels and go for walks in the woods.